Tooth gets fractured when there is any accident to person, especially on face. Tooth is the second hardest substance in the world, that’s why cavities in the tooth enamel are prepared by diamond coated tools. 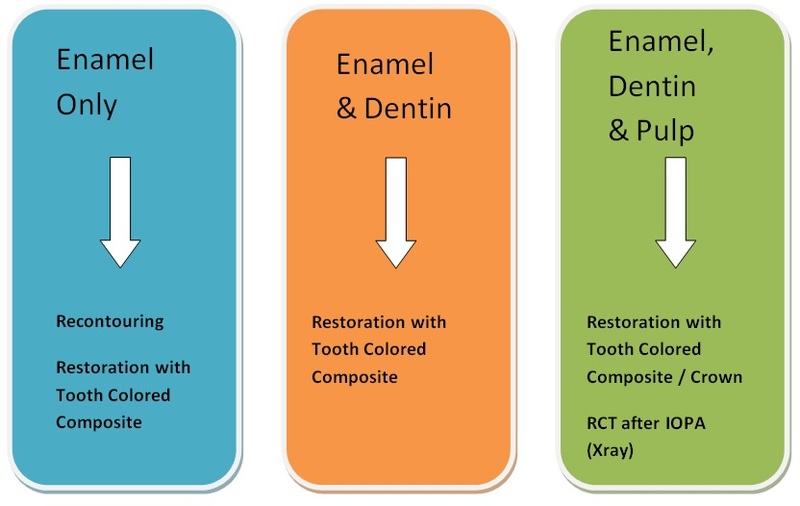 If there is mobility, change in position or if the tooth is avulsed (came out completely), the Tooth should be placed in original position as early as possible and splinted (joined together). This helps to stabilise mobile tooth and healing to take place. Root Canal Treatment may be needed for such tooth after investigations. Avulsed tooth should be brought to dentist as early as possible. If soiled, wash in running water without scraping the surface of the tooth. It should be bought in suitable medium like milk or the person’s own saliva.